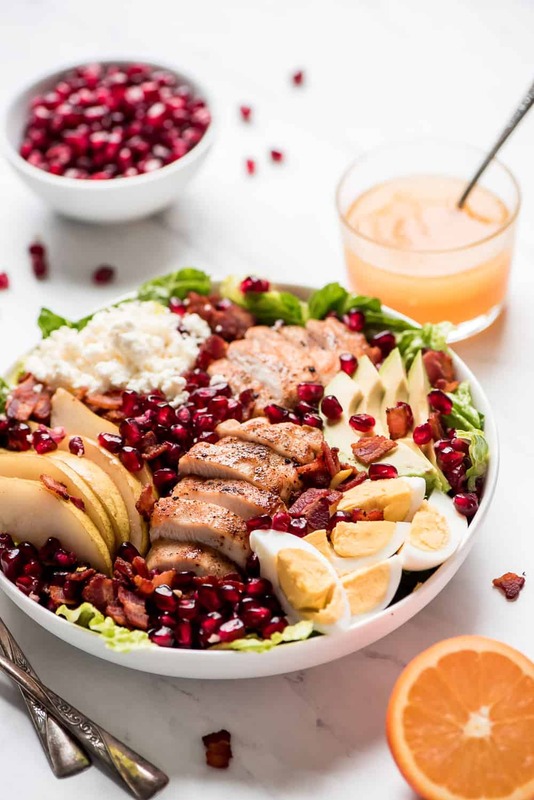 Add more greens into your diet with this refreshing Winter Cobb Salad. This colorful salad is packed with protein and will leave you feeling full and satisfied. Hi friends! It’s Melanie from Garnish & Glaze to share a delicious and filling salad with you. Salads are a great way to fit more nutrient rich foods into your diet. 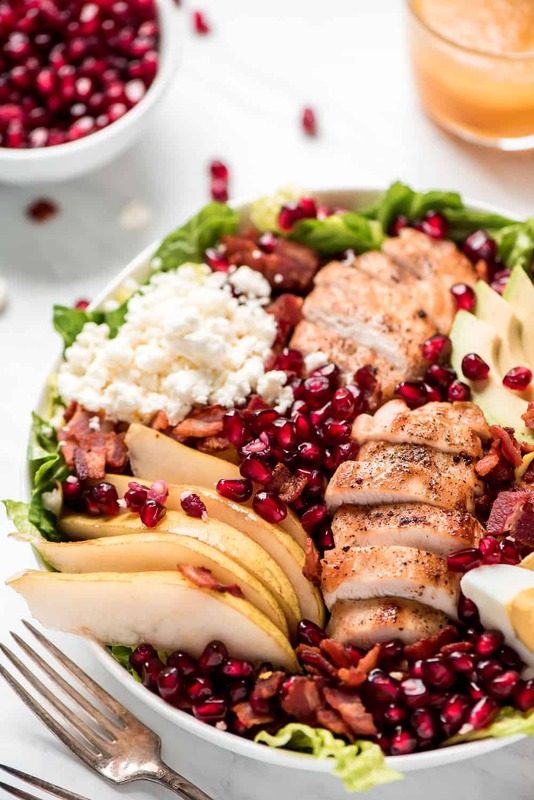 This Winter Cobb Salad is full of winter fruits as well as the classics of a cobb salad. If you weren’t a salad person already, this is sure to turn you into one. I have a major sweet tooth which is why I love putting fruit in salads like my Blackberry Blood Orange Salad and Spinach Poppy Seed Salad, but I also love it because it adds a pop of color as well as freshness. This is especially nice during the cold dreary winter. This cobb salad is quite easy to make. I think the hardest part is not eating all the bacon before it gets on top of the salad. To cook the bacon, I like to chop it up and then fry it in the pan, but you can also fry it and chop it after. Whatever way you do it, don’t throw out all the grease. You’ll want to keep 1-2 tablespoons bacon grease in the pan for cooking the chicken it. It’s so dang good! Just sprinkle the chicken with a little salt and pepper and cook it for 4-5 minutes per side until it’s cooked through. When cool enough, slice it up and add it to the salad or if making ahead of time, refrigerate. 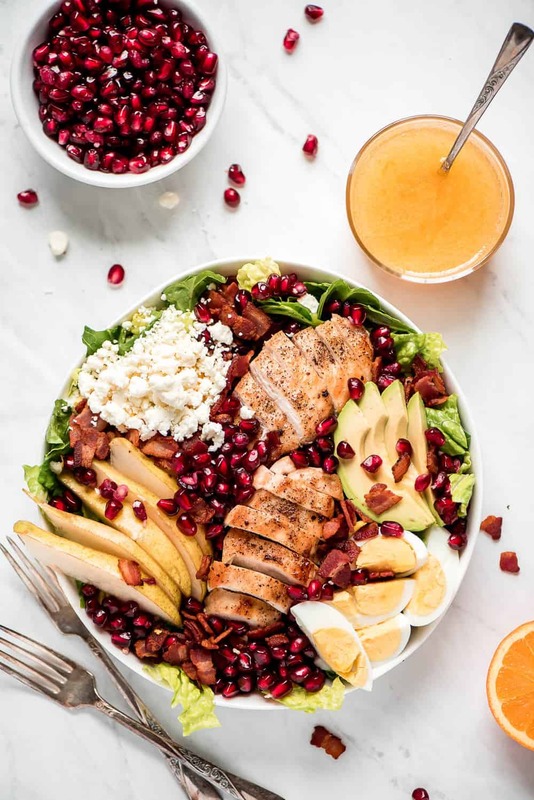 This Winter Cobb Salad has so many yummy toppings but what brings it all together is the Orange Vinaigrette. The citrus adds a burst of sweet tangy freshness. All it takes is fresh orange juice, cider vinegar, oil, a little bit of honey, orange zest, and a pinch of salt. Just shake it up in a jar and pour it over the salad and toss. For the base of the salad, you can really use any type of greens you have on hand. I like Romaine lettuce because of the crisp refreshing texture. If your lettuce isn’t as crisp as you’d like you can bring it back to life by letting it soak in cold water for 5 minutes after chopping it. Then drain and dry it off in the salad spinner. If you aren’t going to eat all the lettuce right away, store it in a zip lock bag and squeeze all the air out. My lettuce stays good and crisp for a week. This makes it easier for me make salads quickly throughout the rest of the week. If your New Years Resolution is to eat a little healthier, start with this Winter Cobb Salad. You won’t regret it! Enjoy! Mix vinaigrette ingredients together in a jar. Set aside. Cook bacon over medium heat in a skillet until crispy. Remove and drain on paper towel lined plate. Leave 1-2 tablespoons grease in skillet. Season chicken on both sides with salt and pepper. Cook over medium high heat in the pan of bacon grease for about 5 minutes per side or until cooked through. Slice when cooled down. Place lettuce in a large bowl. 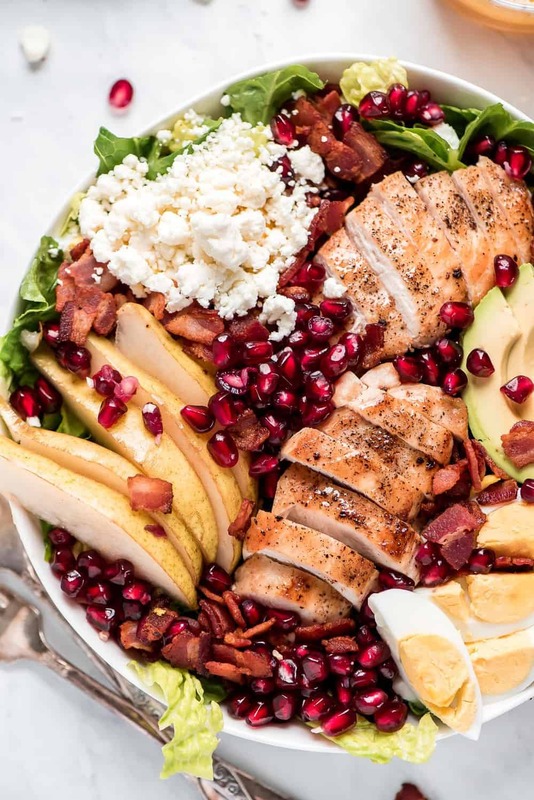 Add the chicken, eggs, pear, bacon, avocado, pear, pomegranate, and feta. Drizzle vinaigrette on top, toss, and serve.